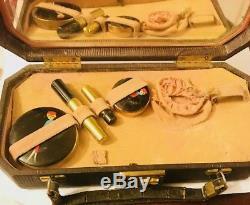 1920s HAND PAINTED POWDER/ROUGE/LIPSTICK SET IN ORIGINAL LEATHER CASE - SO RARE! 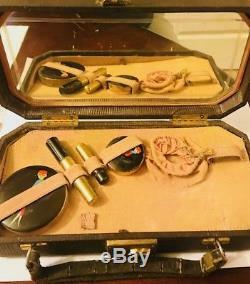 THIS 1920s HAND PAINTED VANITY SET IS SO INCREDIBLY RARE IN ITS ORIGINAL LEATHER CASE!!!!! The leather case is in good condition for being almost 100 YEARS OLD! The mirror inside is good. The handle is securely affixed on the leather case. Case measures 10" x 5" x 2 height. Case opens and closes securely. Inside has all of its original pieces of the set! All pieces match and are HAND PAINTED. The powder compact has black enamel background with hand-painted lady in red dress and red hat. Lid with enamel is in good condition. Compact opens and closes securely and just minimal loose powder remaining inside. Powder compact measures 2.5 dia. 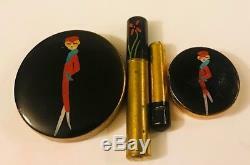 Compact has black enamel background with hand-painted lady in red dress and red hat. Lid with enamel is in good condition; lid itself has "dent" Compact opens and closes securely and just has minimal rouge inside with original rouge puff. Rouge compact measures 1.5 dia. 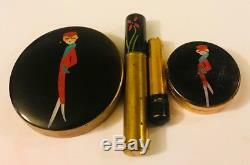 Large lipstick tube end has hand painted black enamel and red flower. Enamel is in good condition. End has hand painted black enamel and red flower. 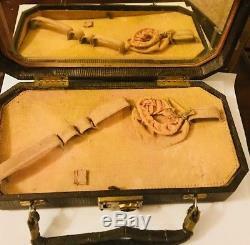 EXTREMELY RARE TO FIND FULL SET IN ORIGINAL LEATHER CASE!!! 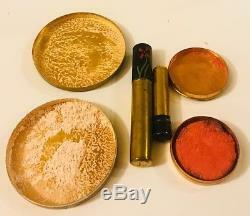 The item "1920s HAND PAINTED POWDER/ROUGE/LIPSTICK SET IN ORIGINAL LEATHER CASE- SO RARE" is in sale since Friday, December 14, 2018. 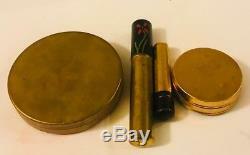 This item is in the category "Collectibles\Vanity, Perfume & Shaving\Compacts\Pre-1930". The seller is "lawgirl0425-9" and is located in Puyallup, Washington. This item can be shipped to United States, Canada, United Kingdom, Denmark, Romania, Slovakia, Bulgaria, Czech republic, Finland, Hungary, Latvia, Lithuania, Malta, Estonia, Australia, Greece, Portugal, Cyprus, Slovenia, Japan, China, Sweden, South Korea, Indonesia, Taiwan, Thailand, Belgium, France, Hong Kong, Ireland, Netherlands, Poland, Spain, Italy, Germany, Austria, Bahamas, Israel, Mexico, New Zealand, Philippines, Singapore, Switzerland, Norway, Saudi arabia, Ukraine, United arab emirates, Qatar, Kuwait, Bahrain, Croatia, Malaysia, Chile, Colombia, Costa rica, Dominican republic, Panama, Trinidad and tobago, Guatemala, El salvador, Honduras, Jamaica, Antigua and barbuda, Aruba, Belize, Dominica, Grenada, Saint kitts and nevis, Saint lucia, Montserrat, Turks and caicos islands, Barbados, Bangladesh, Bermuda, Brunei darussalam, Bolivia, Egypt, French guiana, Guernsey, Gibraltar, Guadeloupe, Iceland, Jersey, Jordan, Cambodia, Cayman islands, Liechtenstein, Sri lanka, Luxembourg, Monaco, Macao, Martinique, Maldives, Nicaragua, Oman, Pakistan, Paraguay, Reunion.